The feeding habits of an unusual 200-million-year-old fish have been uncovered by a University of Bristol undergraduate in a groundbreaking study which has been published in Palaeontology, a leading scientific journal, this week – a rare achievement for an undergraduate student. The Jurassic fish, Dapedium, known from the Lower Lias rocks of the Dorset coast around Lyme Regis, was one of many new groups of fishes that came on the scene 200 million years ago. These included ancestors of the modern teleost fishes – the group of 30,000 species of salmon, cod, seahorses, and perch – that dominate the waters today. This distinctive fish was also one of a number of ancient animals first discovered by the pioneering nineteenth century fossil collector Mary Anning, and fascinated early palaeontologists such as Henry De la Beche and Louis Agassiz. 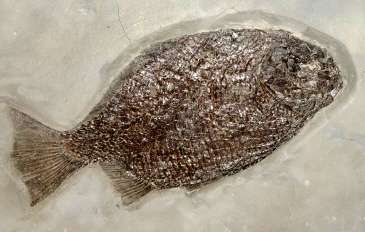 Dapedium was a deep-bodied fish, shaped like a dinner plate in side view, which could grow to over half a metre in length. It had a tiny mouth with jutting front teeth and masses of pebble-shaped teeth further back. In his research, Bristol undergraduate Fiann Smithwick applied a new lever-based mechanical model, developed to understand the jaw mechanics of modern fishes, to reconstruct the feeding behaviour of this extraordinary ancient fish. "My work indicates that Dapedium was well adapted to crush shells," said Fiann, "feeding on bivalves and other hard-shelled creatures that it could scrape from the sea floor." He examined 89 specimens of Dapedium in the Natural History Museum, Bristol City Museum, and the Philpot Museum in Lyme Regis, and measured the positions and lengths of the jaw bones. He calculated the positions and orientations of jaw muscles and varied these to include all possible models. "Every time he ran the model, the result was the same," explained Professor Mike Benton, Fiann's supervisor. "The outputs showed that Dapedium was a shell crusher. Its jaws moved slowly, but strongly, and so it could work on the hard shells of its prey. Other fishes have fast-moving, but weaker jaws, and those are adapted for feeding on speedy, slippery fish prey." In comparisons with modern fishes, Dapedium matches closely the modern sea breams. These fishes are also flat-sided and deep-bodied, and they crush shells in their small mouths, armed with blunt-topped teeth. Dapedium lived side-by-side with the great sea reptiles of the Jurassic, such as the dolphin-shaped ichthyosaurs, long-necked plesiosaurs, and even some marine crocodilians. Dapedium probably escaped being caught by these reptiles because it was so thin-bodied it might be hard to see head-on, and it probably lurked close to reefs and the seabed. "We are delighted to see such an excellent piece of work carried out by an undergraduate," said Professor Benton. "Fiann was funded by a Summer Research Bursary from the Palaeontological Association, and he devised the project himself, learned the numerical techniques, and wrote it up himself. It's rare for an undergraduate to be able to do all this and pass the scrutiny of one of the world's leading scientific journals."